Brecknell PS1000 weighs only 60 lbs, two easy access carry handles makes this scale convenient to relocate. There are no installation costs and no moving parts that require maintenance. Accomplishes a multitude of weighing jobs: livestock, pets, feed carts, bulk containers, shipping and receiving and more. The Brecknell PS1000 general purpose floor scale has become quite a hit with our agricultural customers. The scale took the old idea of the VD1000 scale but brought it in at an affordable price. The previous product was basically twice the price for the same functions and features. This Salter Brecknell PS-1000 fits several applications perfectly – 4H participants can weight their animals up to 1,000 lbs; Alpaca owners can use the scale as a daily health check (detecting weight loss or gain); Food rationing can be done using the weight divisions of 0.5 lbs; and last – the scale can be used in industrial applications for drum weighing, shipping weights, and any other general purpose tasks needing an accurate weight! The model PS1000 ships via UPS saving freight and is available with a very economical indicator stand to complete the package. The scale operates on four (4) AAA batteries (apprx battery life 20 hrs) or 6 VDC, 500mA adapter, both included. Includes a stainless steel housed indicator with black plastic bracket for wall or stand mounting. 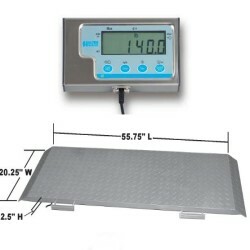 Scale weighs around 65 lbs w/ 2 easy access carry handles which make scale convenient to relocate. No need for ramps or recessed floors, as this unit comes with ramped ends. The dimensions of the scale platform are 55.75" (L) x 20.25" (W) x 2.5" (H). Accurate - Provides consistent accuracy within 0.1% and comes equipped with an indicator for fast digital read out. Portable - Weighing only 60 lbs, two easy access carry handles makes this scale convenient to relocate. No need for ramps or recessed floors, as this unit comes with ramped ends. Economical to Own - There are no installation costs and no moving parts that require maintenance or adjustment. Versatile - Accomplishes a multitude of weighing jobs: livestock, pets, feed carts, bulk containers, shipping and receiving and more! PS1000 ...... 816965001460 ........ 55.5" x 20.1" x 2.5" Capacity: 1,000 x 0.5 lb.